Goonie Rides! is the fifth level of World 5 in Super Mario World 2: Yoshi's Island and Yoshi's Island: Super Mario Advance 3. As the name suggests, the player will have to ride on top of Goonies to reach certain parts of this level. This level also includes a Morph Bubble that allows Yoshi to morph into a Helicopter. The player will use Purple Yoshi in this level. Purple Yoshi will start in some plains, with a Bubble Dayzee and a Goonie. Some Coins can also be collected here. Ahead, Yoshi will find some Goonies carrying green Shy-Guys, a Crazee Dayzee, Hefty Goonies, and Bowling Goonies. Some Mufti Guys also hide in flower bushes here. Progressing through the level, avoiding some Goonies falling from a tall platform, Yoshi will find a Warp Pipe in the top of a plain, thus forcing Yoshi to ride a Goonie to reach the pipe. Near this pipe, a Red Coin, among normal Coins, can be collected. The pipe takes Yoshi to an area in the sky, with Bumpties sliding in Ice Blocks. All the Bumpties must be defeated to cause a Flower to appear. Outside of this pipe, Yoshi will have to cross a dangerous area, filled with Piranha Plants, Bubble Dayzees, and Mufti Guys. A Winged Cloud containing stars can be found here. In the end of this area, Yoshi will find a Red Egg in the middle of a wall. To collect this egg, Yoshi must hit it with his tongue. 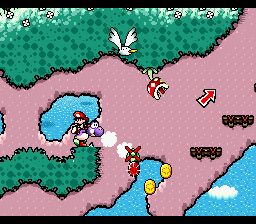 The second area of the level contains two Yellow Eggs, that must be collected by the same way as the Red Egg in the first area. Passing through a Middle Ring, Yoshi will find a Morph Bubble, which will transform him into a Helicopter, allowing him to fly through a large area containing Red Coins, Goonies, two Flowers, and two Wild Ptooie Piranhas. In the third area, Yoshi will find another Middle Ring, a Fly Guy holding a Winged Cloud, a Wild Ptooie Piranha, and a Piranha Plant blocking the way to a Flower. Ahead, Yoshi will find various ! Switches, to cause blocks and coins to appear. Using this blocks and platforms, Yoshi will ride the last Goonie of the level, allowing Yoshi to reach a high platform with the last Flower, and the goal.